One of the most common arguments against urban gondolas I hear is the issue of women’s safety. The argument goes that women will not want to “be trapped” in a small box in the sky for fear of having to ride with another “sketchy” individual. Fair enough. Argument 2: Urban gondolas are now equipped with closed circuit cameras and intercom systems. This argument is useless because it is a measure designed to deal with a problem after it’s already occurred. These arguments tell people (women in particular) that their emotions are wrong; that statistics prove they are foolish for feeling the way they do. Telling people that their emotions are illegitimate is not the way to convince them of a product’s effectiveness and the entire public transit industry is complicit in this. I made that very mistake here. Transit agencies love to demonstrate that public transportation is faster, safer, cheaper and better than the private automobile. So much so that telling people transit is good is an industry unto itself. And yet there isn’t a single city in North America where public transit is the transportation mode of choice for the majority of commuters. Telling people what to think and how to feel just doesn’t cut it. Tactic 1: Fully automate your ticketing operations. This is already standard practice with a lot of transit systems, but should be standard practice with cable. Tactic 2: Use attendants at every station. This helps with loading, off-loading and passenger requests. You can afford these attendants because your cable transit vehicles are driverless and your ticketing operations are automated (Tactic 1). It should be noted, station attendants are standard on all urban gondola systems. Tactic 3: Use slim-profile stations. Small stations are easier to police and attend than large stations. Think streetcar platform small. Tactic 4: Stay low to the ground. Keeping your vehicles as low to the ground as possible increases access to emergency services. Tactic 5: Provide all-women cabins during daytime hours. This is a low-cost, easy policy to implement that has been used in cities around the world on traditional transit systems. Tactic 6: Provide single-rider/group cabins during evening hours. This, again, is a low-cost, easy policy to implement. Provide some means to communicate which vehicles are currently in “single-rider” use to prevent new passengers boarding at other stations. Station Attendants are standard practice in all urban gondola systems. Image by Steven Dale. Station Attendants not only provide increased security, they can assist those who require assistance entering and exiting a vehicle. Image by Steven Dale. Tactic 6 is the most important because it increases both perceived and actual levels of safety for all because riders can self-segregate as they see fit. It is also a tactic that only CPT can offer. The reason cable alone can offer this is simple: Drivers are too busy driving to be attendants. And if you have drivers, you probably can’t afford attendants. 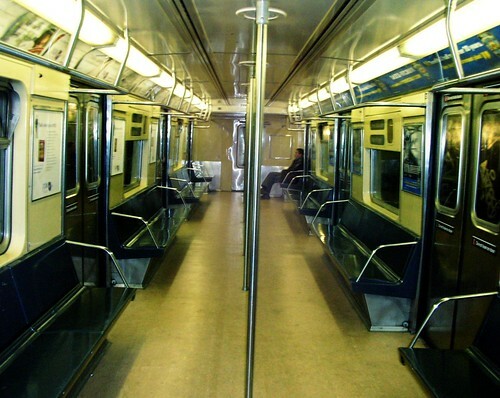 Furthermore, during off-peak hours, transit vehicles are mostly just empty seats. Because there are no drivers in the vehicles, there is little additional cost in providing single-rider/single-group cars. The small vehicle size of cable increases this capability. Such tactics and policies are simple to create and easy to execute with almost no additional cost. By doing so, public transit can finally stop telling people they should feel safe and get to the real work of making them safe. Creative Commons image by moriza. I haven't actually seen people get on or off of CPT, why can't it be like getting into an elevator? Attendants at every station? Ouch. That's a high labor cost that's going to limit hours of operation severely. Off peak, making every vehicle be single-party seems like a fair protocol. Tactic 6 is actually a good argument for Cable Gondola PRT, that crazy concept I've discussed here before. If gondolas are small and take one to four passengers directly to their destination (we discussed a lot of low tech shunting), no one could get on at a subsequent station and assault you. Also, passing through a station every few minutes would provide an opportunity for intervention if an assault occurred. "Tactic 5: Provide all-women cabins during daytime hours." Many white people find that being in proximity to black people makes them afraid or emotionally uncomfortable, and avoid public transit or certain other public spaces for this reason. Does this mean we should accommodate their irrational emotional response by providing "all-white cabins" (and public restrooms, and schools, etc)? Of course not! When people's emotions are _wrong_, and statistics prove they are foolish for feeling the way they do, you should tell them their emotions are wrong, and do everything you can to get them to become less wrong. This is especially so when appeasing their irrationality leads to something as morally repugnant as segregation.